I’ve decided to test the waters. My ’49 Diamond T model 201 pickup is mostly all original except the engine and it had a paint job 35-40 yr ago. Original red paint. Always Shop kept. Hasn’t seen a rain drop in about 40 yr that I’m aware of. Engine is a 292 Chev truck engine. Original seat upholstery. Brand new oem type wiring harness. New brakes all around with new bearings in the rear hubs. 5 good www tires. All 5 full chrome wheel covers. Currently the engine has a lifter problem. I haven’t taken the time to tear into it yet. 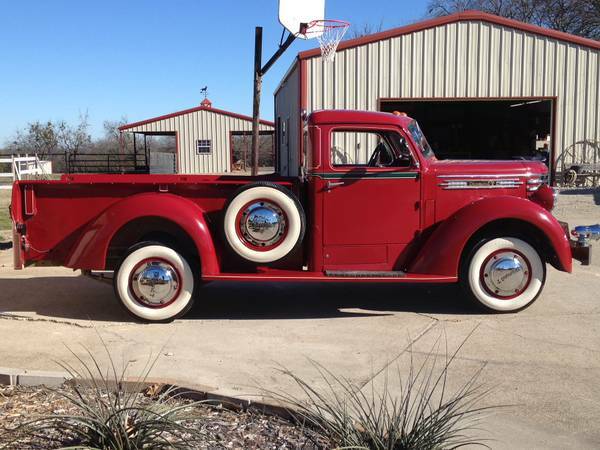 This a very nice and super clean original truck. I’ll entertain offers but no lowballers or insults. And no I don’t need help selling. I have another truck spotted is the only reason I’m even offering this truck for sale. Very sharp, a head turner!! Also very rare. Clean Texas title in my name.